According to our Forum, It is currently Wed Apr 24, 2019 8:21 pm, please have a look around and feel free to Register. It's free and really easy! An area for reviews of all item specifically air related. In conjunction with their work with Kittyhawk to bring us the new 1/48 UH-1D/H Iroquois. Floyd Werner from Werners Wings in the USA has been working on some additional markings to go onto the kit. 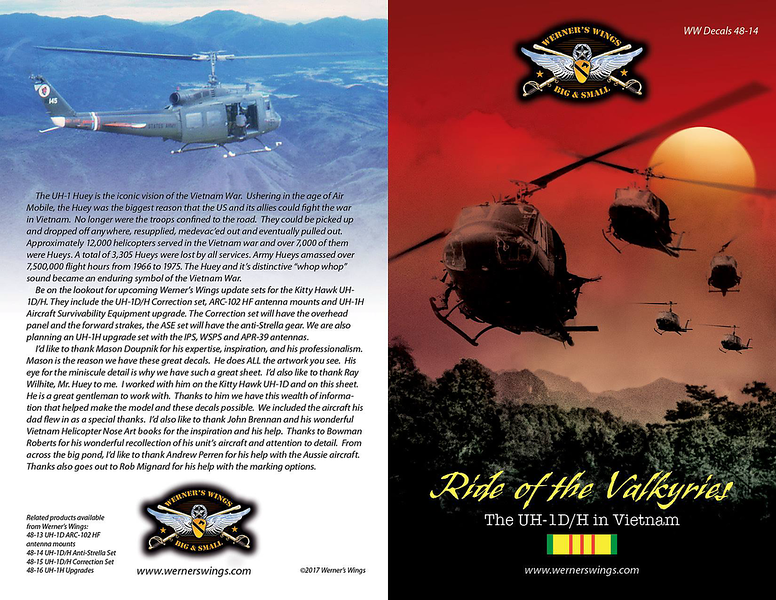 This first sheet is specifically aimed at Vietnam era Hueys and 2 RAAF aircraft are included. Full disclosure - I've been working a bit behind the scenes with Werners Wings to get them to include RAAF schemes on the sheet. Looks like my pestering paid off. I've got this first sheet on my bench now to go onto a KH Huey that I am building for The Modelling News. Here are some pics to show some of the included markings ( there are 14 options i believe ) and enough stencils to do one aircraft. The profiles. Options 7a & 7b are the two RAAF options. 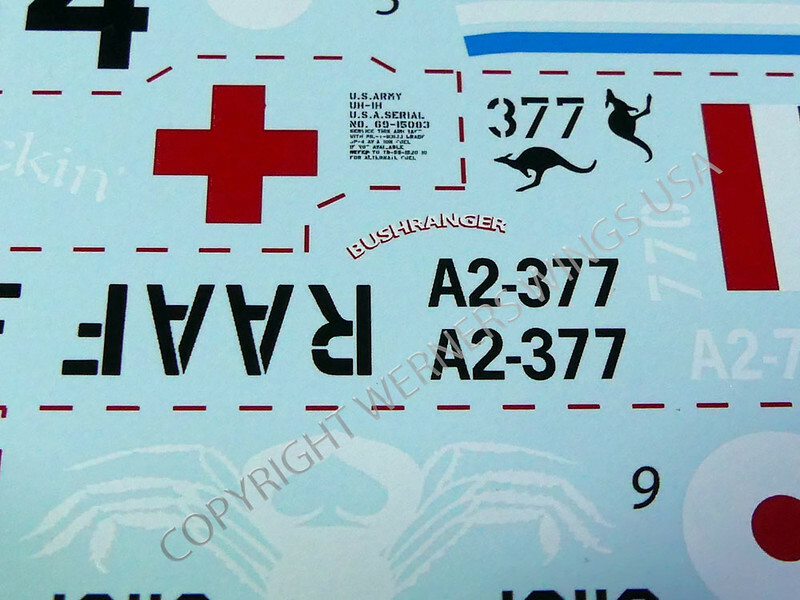 A2-377 has the standard marking setup for Vietnam and includes the option of the Bushranger Nose art. Some more interesting US Army schemes. The decals are printed by Microscale in the USA and my copy is sharply printed and in perfect register. 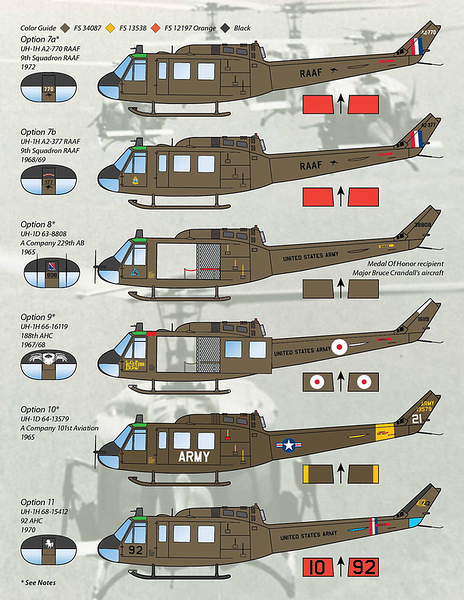 So as Molly says - do yourself a favour and get on these if you are interested in a 1/48 Vietnam RAAF/US Army Huey. 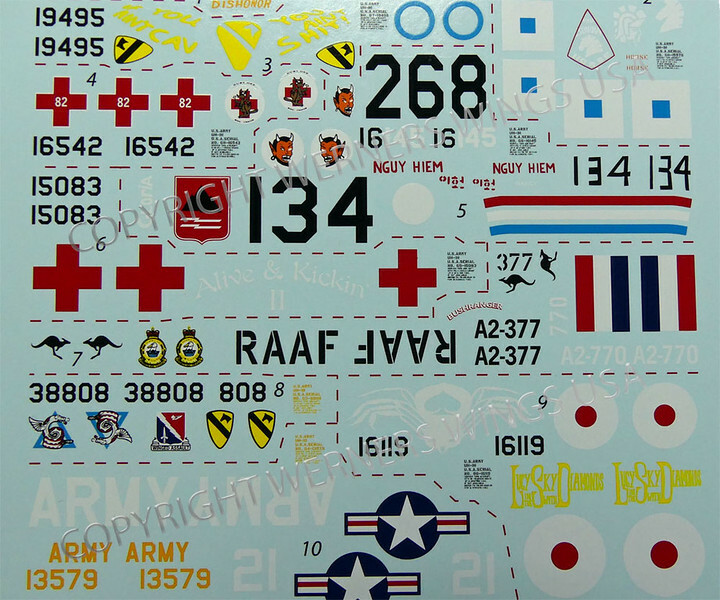 Floyd is also releasing some resin update and corrections sets for the KH Huey - available from his website. They look good. 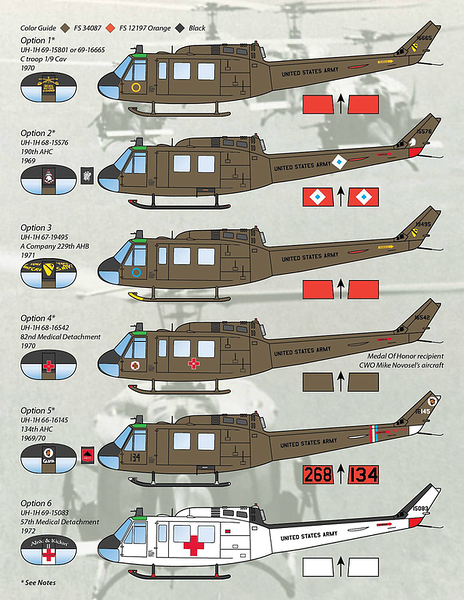 I see they have stencil decals for the Hueys too. Well done on getting the RAAF options included. 770's white markings are definitely post SVN but interesting none the less as they represent that interim period after 9 SQN's return to Australia in 1971 before the full colour markings and white roof were applied. Sadly, 770 was involved in a CFIT accident in November 1978 at El Alamein Camp in SA which claimed the lives of CO 9SQN and the other four occupants. Yes they have depicted 770 when Roly Deighton had to autorotate to a forced landing near Coffs Harbour on 23 March 1972 on the way to Ex Rising Tide. One thing though I am disappointed in is the depiction of the tail serials, they should be in the same stencil style as the nose number. Not sure what went on there.